We are the first generation in Cambodia to grow up happy. Our parents and their parents suffered in the regime of Pol Pot. Our generation wants to make this country a better place, a good place to live. My name is Pom Sothea and I grew up in a province far from Phnom Penh. I always wanted to study, but the people around me, like my father, they used to drink a lot and gamble. They didn't appreciate education much. My parents told me if I want to study, I need to support myself. From 5th grade to 12th grade I did a lot of small jobs to be able to get myself an education. I sold fruits and killed fish and animals to get money to go to school. It took a lot of time. But I knew I did it for myself, for a better future. I could already at a young age realize that growing up without an education will not bring me a better future than I could see around me on the farm. I think education is a key thing in building up Cambodia. From the 7th grade until I finished high school had to get up at 4 in the morning. I left to school by 5 and had to go there 15 km one way. I needed to bicycle, walk, and climb three mountains to get there. After school from 3-4 p.m. I taught children in my village to read and write. They all just wanted to learn so much, but couldn't go to school because of their parents. They came already at 12 to my house to wait for me. And I wanted to teach them, to help them get a better future. 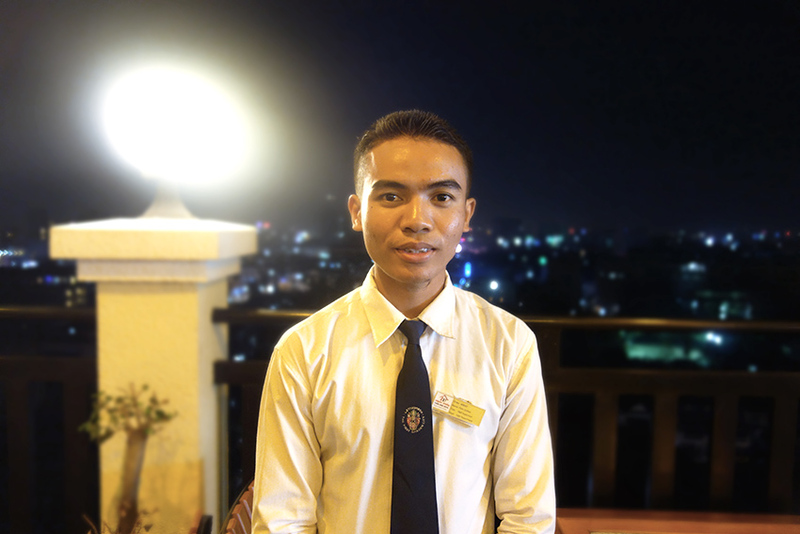 Now at 21, I work at a hotel in Phnom Penh. I study part-time at the university. I have worked here for 11 months and saved up money so I can next year start as a full-time student. I wish to be an English teacher when I graduate. Everybody can do anything they want to, if they really wish so. It might require a lot of work, but it is still possible. I have had hard times in life, but I think it has all been worth it. I don't wish to have a lot of money. I have seen so many people with a lot of money searching for happiness, not realizing that money can't buy it. You need to do good things to be happy. I want to do good things. So what is it that you dream about in life? I just want to be an English teacher and teach children English so that they will also have a better future. It might take generations to build up this country, but I think everybody should work for that. To do good things, so that everybody will have a good life and will be taken care of.